As colder weather begins to settle in over parts of the U.S., and the remaining regions are crossing their fingers that a cold front blows in soon, snowmobilers are gearing up for the riding season. While local trails and familiar locales are fun for a Saturday ride, where do you head when it’s time to load up the sleds for a week and take a winter riding adventure? 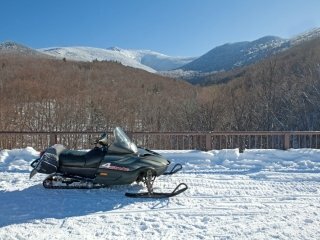 Popular snowmobiling destinations are scattered across the United States, drawing riders with the same vigor that lures skiers to Aspen. So, just where are these sled head meccas? 1. Upper Peninsula Michigan: Mid-Westerners find winter fun in the deep snows of Michigan’s Upper Peninsula, or “U.P.” area. The state of Michigan is home to over 3,000 miles of snowmobile trails, making it no surprise that many towns within the Upper Peninsula cater to sled riders in the winter months. The local season usually begins in December and lasts until late Spring with deep snow and consistently chilly temperatures. 2. Tug Hill, New York: East Coast dwellers benefit from the lake effect snow storms that blanket New York State’s Tug Hill plateau. Known in summer for an extensive ATV trail system, the area becomes accessible to snowmobile riders in the Winter months. Both campgrounds and lodge-style inns provide welcome accommodations that make this an understandable sled resort destination. 3. West Yellowstone, Montana: Nestled next to Yellowstone National Park, West Yellowstone offers riders access to scenic trails that showcase some of the splendors that make the Yellowstone area so special, without all of the regulatory restrictions of riding in the park itself. This summer tourist town transforms into a winter wonderland between late October and December, depending on the year, and is home to a slew of great local eateries and comfy lodging for when you’re back at base camp. 4. Togwotee, Wyoming: If you’ve never been to Wyoming, snowmobiling is the perfect excuse to go, fall in love, and never want to leave. Togwotee pass sits about 50 miles northwest of Jackson, WY and offers backcountry scenery that is among some of the most stunning in the West. Not to mention, stellar western snowfall combines with the ski town charm of Jackson to give riders access to an awesome time in town, on trails, or experiencing epic backcountry riding. 5. Priest Lake, Idaho: They don’t just grow potatoes, you know. The Priest Lake area of Idaho is home to over 520,000 acres of public land. At just 2,400 feet in elevation at lake level, the surrounding mountains tower to over 7,000 feet, making Priest River a great base camp for riding in the surrounding mountains on hundreds of miles of trail. Whether you choose to venture beyond the norm and dedicate one of your vacation weeks this year to snowmobiling in a new locale, or simply head out to your favorite local trail head, get out there and enjoy your favorite spots; both near and far.